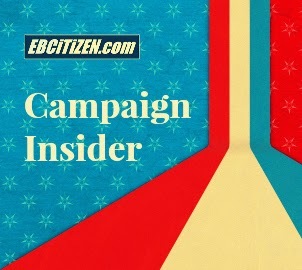 A Tucker in Wieckowski and Swalwell’s Camp | Bock Bopped | Union Buddy in Hayward? CHAPTER 13 | Ro Khanna has the cash to literally buy a Super Bowl ad, but he didn’t. However, his campaign for the 17th Congressional District was the first to hit the airwaves with a 30-second television spot last month. Khanna has $1.9 million to spend from until the June 3 primary, so expect more TV ads in the future. However, the list of East Bay campaigns with the funds to buy expensive ads is very short. In fact, there is likely only four—Khanna, Rep. Eric Swalwell, Rep. Mike Honda and former Assemblymember Mary Hayashi. This week, Swalwell and Hayashi released campaign ads, leaving Honda as the last out of the gate. Campaign finance reports last week, shows Honda is on a fundraising kick putting him at $1 million in cash. That’s more than enough to start thinking about TV ads. As opposed to the Khanna and Swalwell spots, Hayashi is only seen interacting with people, but not heard. Instead, others do the talking while praising her work with women and health care. The strategy meshes well with some of Hayashi’s recent appearances where she’s touted advocacy for women. Hayashi is also sending mailers to voters hitting some of the same notes in the commercial. However, now that her opponent, Assemblymember Bob Wieckowski has gone down the rabbit hole of negative campaigning with a Web site featuring Hayash’s shoplifting arrest, the claws may eventually come out. SWALWELL AND WIECKOWSKI After Friday night’s forum in Fremont, it’s now clear Wieckowski intends to lump his State Senate opponent, Mary Hayashi, with some members in the upper house of the Legislature currently in trouble with the law. And, although, Swalwell has not utter a single negative comment against State Sen. Ellen Corbett in their 15th Congressional District race, most believe he will use the same line of attack against her as the state senate majority leader. However, there’s an interesting connection between the camps. Both employ campaign consultant Lisa Tucker, who helped Swalwell win election to Congress two years ago. The arrangement is potentially fraught with ethical problems since both races overlap the same areas in southern Alameda County. Clearly, Wieckowski beating the drum of an stained state senate creates an echo effect which also helps Swalwell’s campaign against Corbett. With the same conductor leading each orchestra, how can voters guard against some type of coordination? Especially when one candidate has a clear edge in campaign finance in Swalwell, while Wieckowski’s coffers are extremely dwarfed by Hayashi’s largess? KNUCKLE SANDWICH Former Assemblymember Audie Bock, who is running for the 10th State Senate District, recalled during a candidate’s forum Friday, an incident when a Republican member of the Assembly back in 2000 once punched her in the arm when she vowed to not vote for a water bill that was introduced at the last minute and just before midnight. “I told him I’m not voting for a bill I haven’t read,” Bock said, who is nonpartisan, but once a member of the Green Party during her one term in Sacramento. The unnamed legislator then punched her. Some members of the press saw it, too, she said. When they asked her about it, Bock said she covered for the assembly member who was up for re-election. “I told them I fell down.” Flash forward to today. Bock also rides horses, but she won’t be covering for the one who fell on her during a ride a few months ago that crushed her ankle. It’s the reason why Bock is wearing a walking boot. If anybody is looking to buy a colt, she says, she has one for sale. HERE AND THERE Mayoral candidate Francisco Zermeno is continuing a late push for union votes in Hayward even though he was one of the seven council members who harshly imposed a five percent wage cut on 300 city workers. Zermeno is now endorsing the two union-backed City Council candidates, Rocky Fernandez and Sara Lamnin…A 17th(!) Oakland mayoral candidate entered the race to replace Mayor Jean Quan this week. Larry Lionel Young, Jr. officially formed a committee. The former Oakland school teacher ran for mayor in 2010 and the District 3 City Council seat two years ago. In both races, he finished last…The Chronicle had an odd piece this week on 17th Congressional District Republican Vanila Singh, calling her out for some strange campaign strategies. The reason it may seem odd is because its fails to realize Singh is a political novice competing with little money relative to Rep. Mike Honda and Ro Khanna. A minor leaguer playing in the majors. It’s hard to be conventional in one of the most expensive congressional race in the country. That being said, Singh is extremely raw as a politician, but the Republican Party’s instincts are correct, she could be a rising star, if time and money is used to cultivate her candidacy. But her time is not now. Posted in Assembly, Audie Bock, Bob Wieckowski, Ellen Corbett, Eric Swalwell, Francisco Zermeno, Mary Hayashi, Mike Honda, Oakland, Ro Khanna, tv ads, Vanila Singh. Bookmark the permalink. She will run through the money and still have only the very slimmest chance of winning. It seems that if money is available, that those pros (consultants, pollsters, and mail companies) are more than willing to encourage a candidate's delusions of winning. You wonder who was taking a cut of all the millions Meg Whitman was spending. What will Mary do after the dream is dead? I enjoyed watching Mary's campaign video. She has allowed her supporters and community members to speak about her exemplary legislative record and history, instead of spending her time speaking about herself and her accomplishments. True characteristics of a leader. Oh no, all potential politicians should steer clear of the “rising star” label. It.rarely comes to fruition.